When I was growing up in sunny Southern California, we had a massive, sprawling blackberry shrub in the backyard that I would spend hours in the summer sifting through for its precious, juicy treasures until my fingers were raw from the tiny thorns riddling its leaves and stems. This was my first foray into home gardening. Each summer I would wait in eager anticipation till those first under-ripe berries appeared shyly on the vine, and then I’d check each day to see if they’d attained the plump fullness that would indicate they were ready to be harvested. There was nothing so exciting as filling my bowl with such delicious home-grown beauties. Suddenly, a bowl of cereal became a much more exciting prospect. It was suddenly much easier to convince my mom or dad to drive me to Trader Joe’s for some Double Rainbow vanilla bean ice cream, because there is really nothing like fresh blackberries and vanilla ice cream to round out a summer evening’s BBQ. The carton never lasted long. Alas, I now live several hundred miles from the home where I so lovingly tended to “my” blackberry bush. Even if I lived there still, the vines have mostly all withered and no longer produce fruit (I attribute this to the shrubbery going into mourning after I left for college, and never finding it in itself to emerge from its depressed state). I wouldn’t say I took those freely-available blackberries for granted, because I appreciated the bounty to no end. I do, however, miss being able to waltz into the backyard on a whim and conjure up a stash of blackberries for whatever purpose I please. In this case, it would have been for a pie. I’m determined this summer to find somewhere to pick wild blackberries (and maybe strawberries and blueberries too), but until then I am left with two options for procuring one of my favorite fruits: 1), pay an exorbitant price for organic, frozen blackberries or 2) pay an even more exorbitant price for organic, fresh ones. In this case, I chose the former. Not ideal, but until the day when I am lucky enough to have a big backyard with a garden full of wonderful, edible things, among them a thriving expanse of blackberry bush, then it will just have to do. Mix the blackberries with the brown sugar and set aside. I didn’t defrost them first but I would recommend doing that so you have a better idea of how much liquid they will produce, and can better estimate how much cornstarch to use. Roll out half of the the pie dough and press into a greased pie pan. Trim. Put in the freezer to chill. Roll out the other half of the dough into a round top crust. Put this into the freezer as well. Chop the ginger finely. Peel, core, and chop the apples and squeeze some fresh lemon juice on them. Mix the nutmeg, salt, and cornstarch in a small bowl. Mix the blackberries, ginger, and chopped apples. Sprinkle the cornstarch mixture over the fruit and stir thoroughly until well combined; you shouldn’t see any white flecks in the bowl. I added only 1 tablespoon cornstarch but wish I’d added more, probably another tablespoon (the pie came out quite juicy and some more cornstarch would have helped with that). 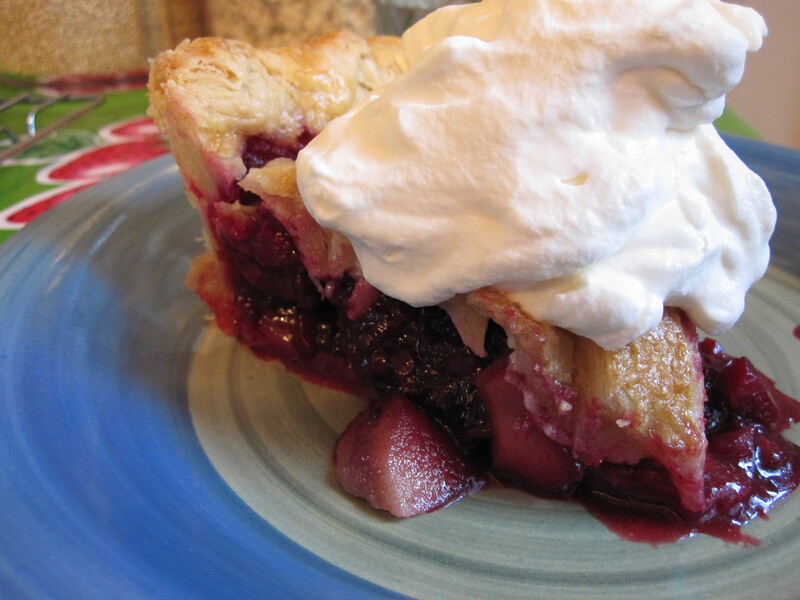 Remove the pie dough from the freezer. Lightly brush the inside of the pie dough with the beaten egg. 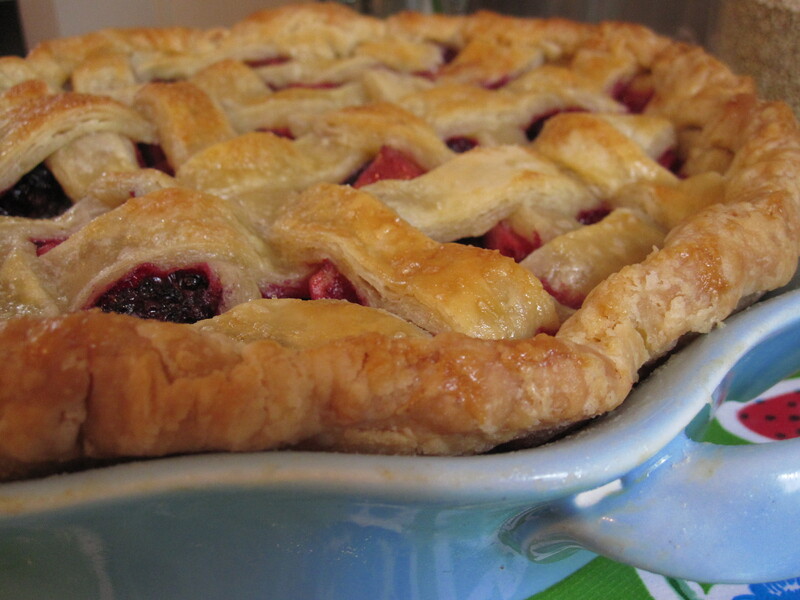 Pour the filling into the pan and top with either full crust or lattice-top. If doing a full top crust, cut slashes in the top. Brush top crust with beaten egg. Sprinkle with sugar. Bake at 375°F for 35-40 minutes or until filling is bubbling and crust is golden brown. 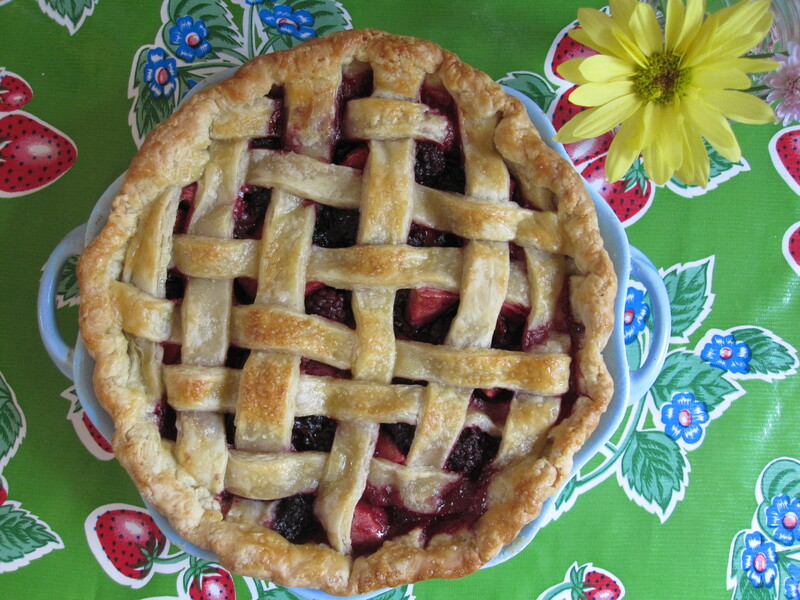 This entry was posted in Pie and tagged apple, blackberry, friday pie day, ginger, pie. Bookmark the permalink. hope all is well alison, give the bay area some love from me and i’ll give france some love from you! My daughter, Allison Domicone, the most precious gift I have EVER had in this world, glorifies me with a blackberry bush. I loved that blackberry bush as well. I was most disappointed when the Ivy took it over. I am not a gardener and these memories remind me so often of that. I know, however, that I nurtured the wonderful being that has become Allison Domicone and I take joy in that. Love to all who enjoy her to.